I have grown elephant ears for years and have loved them. This spring I bought about 5 more and planted them and I have seed pods galore. I would like to propagate them but have no idea how to handle them. Please help with any suggestions on how to save these and prepare them for next spring. Some of this depends on exactly which kind of 'elephant ears' you're talking about. 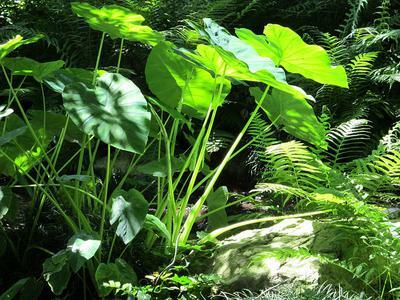 There are several plants that are called this, ranging from Colocasia and Alocasia to Caladium. Having said that, these are all tropical or warm climate plants, therefore they will most likely germinate their seeds without any special kind of care, such as scarification or a cold treatment to break dormancy. In most cases, simply waiting for them to ripen on the plant, harvesting the cases and allowing them to dry in a paper bag, then sowing them in sterilized or pasteurized potting soil will do the trick. Moist (but not wet) soil, and bright but not intense light will trigger the germination process. The best time to do this will be in the early spring, depending on where you are. The seedlings should be big enough to go outdoors in a sheltered spot for the summer. Start them too early and they could fail to thrive and shrivel up if they're stretching for more light. Use a grow light to extend the season and give them a better chance.